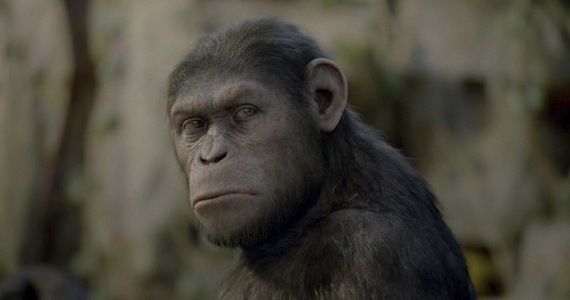 I saw “Rise of the Planet of the Apes,” (RotPotA), last night. It was so good! Truly amazing how much storytelling and conveyance of emotion and thought was accomplished with little to no dialogue and a main character who was completely motion-capture CGI. Andy Serkis is brilliant. The people at WETA are brilliant. It was a fantastic movie. But, you know, I’m a nerd and my brain has a tendency to look for logic, even in fantasy. It doesn’t have to be “real” but I like for my stories to be realistic, assuming the imagined events really happened. I’m totally willing to suspend disbelief and accept that aliens could show up, but then I want their ships to be designed for actual space travel, and I don’t want them speaking English unless there is a very good explanation for how and why they learned it. That type of thing. So with RotPotA, while I enjoyed the film very much overall and was moved by Ceasar’s journey, there were a few things that didn’t add up. And I’m willing to overlook them and say it was still a great story, very well-told, but come on, isn’t this the type of thing having a blog is for? Being able to complain about tiny details in movies that didn’t make sense? Okay, so first of all, although it was a very handy storytelling device that made power dynamics very clear, and although it provided some very emotional moments, Caesar should not have known the palm-up “supplicating gesture”. Unless Will taught it to him, but he obviously didn’t, because he didn’t recognize what it was and had to have Caroline, (his eventual girlfriend), explain it to him. When they go to the redwoods reserve for the first time, Will takes the leash off of Caesar and says something like, “if I take this off, you’ve gotta promise to stay in my sight. I’ll never find you again otherwise.” Caesar is eager to explore and climb the giant trees, but he stays put, looking up at Will pleadingly and extending his hand palm-up. Will doesn’t know what he wants, but Caroline says, “He’s asking your permission. It’s a supplicating gesture,” and takes Will’s hand to brush his fingers across Caesar’s palm, giving him the permission he feels he needs to run off and explore. The same gesture comes back several times later on, and as I said, it is very useful. But the problem with the way it was introduced is that Caesar wouldn’t have known it if, as Will says when he surrenders him to the ape reserve, “He’s never spent any time around other apes.” He was raised entirely around humans, and Will taught him several signs, but not this one. So how does Caesar know it? Is it supposed to be an innate knowledge, like spiders weaving webs? Some animal communication systems are instinctual, like bees and their waggle dances, but many others, even some types of birdsong, baby animals have to learn through socialization with others of their kind. I’m not an expert on primates, but as far as I know apes are not born with an innate knowledge of any kind of social interaction or communication skills such as this “supplicating gesture.” So it is possible that all or most of the other apes would be familiar with this gesture, having lived amongst other apes that also used it, but Caesar would have no knowledge of it unless Will (or Caroline, or somebody) had taught it to him. It would be more likely that he would have signed ASL for “please” or something in this situation, showing the same deference to Will as the alpha male but using a different communication symbol. Probably an ape with super-intelligence like Caesar really could say or approximate something very similar to “No!”, but there is no way he could say “Caesar is home,” the way the does at the end. (Sorry if I just spoiled that bit for you.) Just the word “Caesar” would be impossible, two alveolar fricatives (s,z) and a retroflex approximant (r)?! Not happening. If an ape was exposed to a drug that caused increased brain functioning resulting in super-intelligence, it is entirely possible that he would either vastly expand his signing inventory, (a few hundred signs is the most that apes in research have been able to acquire, compared to thousands of words the average human knows), or even that he would develop his own complex form of spoken language, it just wouldn’t sound anything like English. Or any other human language. I mean, I realize that this development had to happen, plot-wise, in order to set up the original Planet of the Apes movies in which they all talk, but I’m just saying, increased brain functioning doesn’t explain how that could have happened. You’d need an evolution of the vocal tract, too. And by the way, after watching RotPotA I googled “what is an ape” since I was never sure about the exact definition. Wikipedia says the word has several different senses, and in the process of reading I saw “Except for gorillas and humans, hominoids are agile climbers of trees.” So that presents another problem for the movie, because when they break out of the ape habitat they have a gorilla in their group, so how did the gorilla (Buck) keep up when they were swinging through the trees and knocking all the leaves down onto that jogger on their way to the zoo and the bridge? I’m just saying. Realistically he wouldn’t have been able to keep up. Oh well. It is still a great movie. I wasn’t actually expecting to be as moved as I did from this material but Serkis just really channeled the inner ape within him, and nails this perfect motion-capture performance as Caesar. I also sure as hell hope that he doesn’t get snubbed as well. He already did for LOTR! Good Review! I agree, Serkis deserves recognition! His performance was amazing! I nearly cried several times. The reason that gorillas aren’t agile tree climbers is because of their size. They simply get too big to move about in trees all that efficiently, by swinging like other apes do. However, they are still fast and powerful animals, with climbing abilities; keeping this in mind, it might be somewhat plausible that the gorilla could simply jump from tree to tree, considering how they were lined up in a row. At least, that’s the only explanation that is sensible. Otherwise you’re entirely right.